We’re through Week 2 of the NFL season and taking a look at another PFF Elite stat. This time, we’re looking at the leaders in pass-rush productivity. PFF’s pass-rush productivity measures pressure on a per-snap basis with a weighting toward sacks. Overall, it’s a deeper dive into a player’s pass-rushing efficiency that goes beyond just sacks and pressure rate. 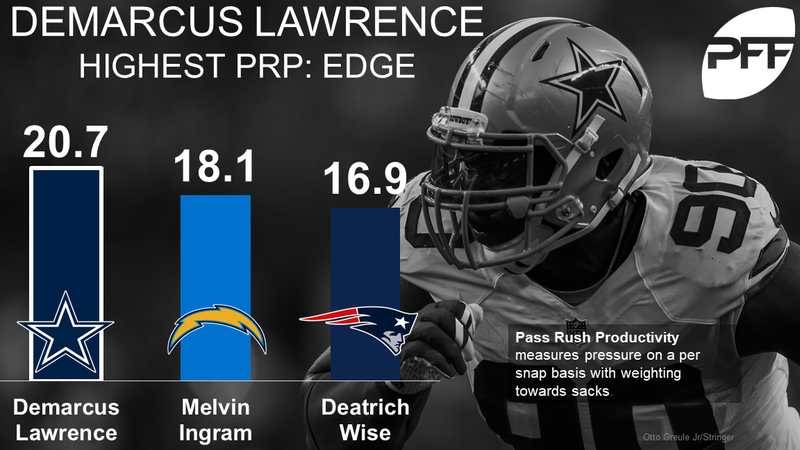 Lawrence is off to a hot start, earning pressures on 13 of his 52 pass-rush snaps. He has converted 38.5 percent of those into hits or sacks (four sacks, one hit). Ingram has picked up right where he left his breakout 2016 season off and has been dominant thus far. He has racked up 13 pressures on 58 pass-rush snaps and like Lawrence, has converted five of them into hits or sacks. Wise has been an incredible surprise for the Patriots thus far. While he has only rushed the passer on 34 snaps he has made his seven total pressures impactful by converting six of them into hits or sacks (two sacks, four hits). Campbell has adjusted well to Jacksonville’s defensive front that finds him on the edge as his primary role, much different from his time in Arizona. So far, he leads the NFL in sacks and has racked up 13 pressures on 66 pass-rush snaps. It’s worth noting however, Campbell faced better offensive tackle talent in his game against the Titans and produced just three pressures on 30 pass-rush snaps. No surprise here — Miller leads the NFL in pressures with 16 and while he has only converted two of those into sacks he has picked up an additional four hits on the quarterback. 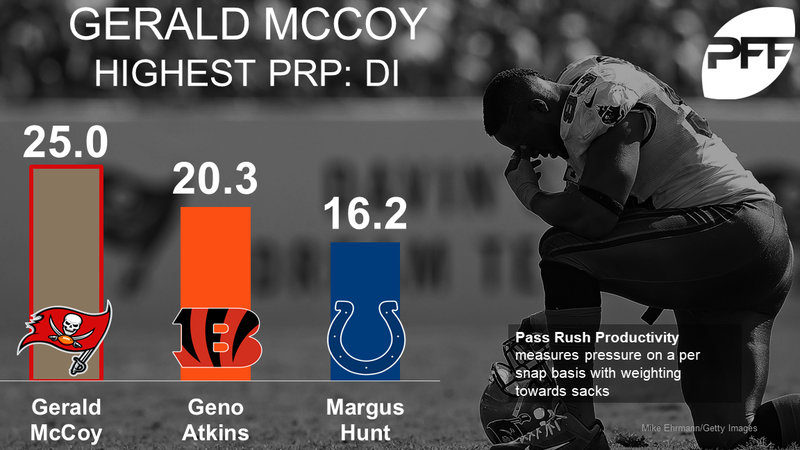 McCoy has played just one game but was dominant on his 27 pass-rush snaps. He racked up nine total pressures with three of them being hits on the quarterback. Bears quarterback Mike Glennon’s time to throw dropped from 2.43 in Week 1 to 2.26 in Week 2 and McCoy was a huge reason why. Atkins has put on a show so far this season. Through his first two games he has rushed the passer on 37 snaps, producing nine total pressures with five being hits or sacks (3 sacks, 2 hits). Hunt is definitely the surprise name on this list, but he has been very effective on snaps he has rushed the passer. While his overall play hasn’t been great, his pass-rush grade lands him in the top-12 among interior defenders and he has racked up seven total pressures on 34 snaps to back it up. Three of those seven have been hits or sacks. Buckner has been nothing short of remarkable in the first two games of the season. While he hasn’t yet notched a sack, he’s racked up the second most pressures among interior defenders and has laid a hit on the quarterback five times. Perhaps the most impressive part of Buckner’s game is sustaining his pass rush ability while playing significantly more snaps than anyone else on this list. Heyward rounds out the top five by leading interior defenders in total pressures at 13. While he has done it on more snaps than the others on this list, he has still been very efficient. He has converted five of his pressures into sacks or hits (2 sacks, 3 hits).